The Pines at Four O'clock homes for sale are a mix of single-family houses, duplexes and townhomes neatly tucked along the north side of the Four O'clock Run below the slopes on Peak 8 of the Breckenridge Ski Resort. Four O'clock Run, so named because it brings you home at the end of the day, is a groomed, very gentle, skiable link from the slopes, and is used by skiers who live near it or as an alternative to public transportation to town. The Pines is located on this run, uphill from the base of the Snowflake Lift, so homeowners can also begin their day by skiing a few yards down 4 O'Clock. The Pines are a mixed development with properties on a third to a half of an acre, but most of the homes share a common wall. Even these, however, are full sized homes, although on a small footprint. Any of the homes for sale in the Pines at 4 O'clock will lie in a natural setting overall because of several small parcels of dedicated open space adjacent to the Pines. Find out more about living in this beautiful community. If you are ready to start your search, browse the current Pines at Four O'Clock real estate listings below. In the summer, 4 O'clock Run is a direct path to town, and link to the trails and roads on the ski mountain for residents of the Pines. Everything above the base area is national forest and includes several roads and trails for biking, hiking or wildlife spotting. Cross mountain trails extend from the nearby Breckenridge Outdoor Education Center and Sawmill Reservoir and connect to more, far-flung trails. 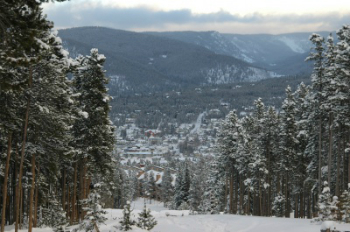 From the Pines, downtown Breckenridge is little more than a mile away by car. The free town shuttle bus services Ski Hill Road, winter and summer and stops at the intersection with Grandview, which is only a few blocks from Tall Pines Drive, and the homes of the Pines. The uphill destination of this bus route is the Breckenridge Ski Resort. Directly across Ski Hill road from the bus stop is the Breckenridge Nordic Center, with 28 kilometers of groomed track and 12 kilometers of snowshoe trails. Size (sq ft. living area): 2248 sq. ft. to 5340 sq. ft. The Pines at Four O'clock are located between Ski Hill and Four O'clock Road off Grandview Drive. From Main Street, drive west on Ski Hill Road for .6 mile, turn south (left) on Grandview and then southeast (left) on Tall Pines Drive. Are you ready to discuss the real estate opportunities in the Pines at Four O'Clock neighborhood of Breckenridge? Contact us now.